Today I’m thankful for people who make me better. I hope all of you have someone, or several someones, in your life who push you to be the very best at whatever you do. I am many things (teacher, runner, daughter, sister, wife, friend), but today I want to thank those people who push me to be a better writer. 1. My critique partners: I met my two awesome critique partners through the love connection on Maggie Steifvater’s blog. I cannot stress enough how much writers need critique partners. I was very nervous exchanging my work with strangers, but I couldn’t be luckier to have met Kate and Abigail, who took my manuscript and improved it. They told me where it was slow, where it was weak, where I could do better. Yes, they told me the parts that worked as well, but they didn’t only tell me how much they loved the story because that wouldn’t have helped at all. They said things that I knew were true but had been afraid to admit. They helped mold my story into the one I was trying to tell, and they kept me from giving up when things got hard. There was a point when I was pretty sure I was going to have to trunk this novel, but with their encouragement and help, I sold it instead. I am so thankful I listened to them. 2. My editor: I know I lucked out when I landed Danielle Ellison as my editor. She answers my emails almost immediately, Skypes with me whenever I need, and pushes me to make my manuscript what she knows it can be. She loves my stories and characters almost as much as I do, which is such a relief, but she doesn’t allow me to be lazy or sloppy, which is an even bigger relief. But she isn’t just making this book better. She’s making me better, so that the next book and the next and the next will reflect her influence and her drive to make me the artist she knows I can be. It means so much that she believes in me enough to ask me to do hard things. She believes I can do them, so I can. I'm so grateful for that. 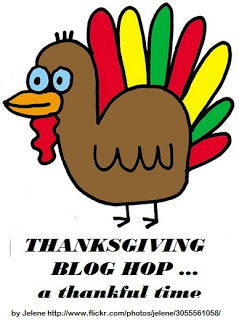 So stick around this month to see all the things I'm thankful for, and participate in the Thanksgiving Blog Hop at Brenda Drake's blog. How wonderful to find such an awesome group of writers who support you and your stories! Nice to meet you Talynn. Support for our stories is so important! Congratulations on your publishing deal, that must be super-exciting! I agree about CPs, having a T'giving post about mine coming up at some point :) Nice to "meet" you. I am super excited about my debut. It's been an awesome expereince so far. Nice to "meet" you too! I have been lurking on your blog for a while now, but now that I've been called out by name, I simply have to comment : ) Had no idea you had written a thankful post when I popped over here--what an awesome surprise! Just joined in the blog hop today and really enjoyed your lists. Such wonderful things to be thankful for!